Wow! Today was yet another crazy day in Europe on the 2018 MYO Tour. The day started for most members somewhere around 7:30 AM when we met up for breakfast in the lobby of the hotel. A gorgeous buffet complete with breads, croissants, fruits, bacon, eggs, cereals, and of course a (to die for) cappuccino maker. I filled up on bacon and bread. At 8:45 AM, breakfast was over and we were asked to meet in our chaperone groups in the lobby. During this meetup, we sang a beautiful rendition of Happy Birthday to Molly Perrone who turned 18 today! After everyone was definitely present, we boarded the buses. The buses took us to Grunewald Church where we rehearsed from 10-12 for our impending concert. The church was absolutely gorgeous. A bit dusty, but gorgeous nonetheless. The choir rehearsed first. We had a very productive rehearsal and practiced the nine pieces to be performed later tonight. The orchestra set themselves up for greatness with all their chairs and instruments. The choir watched with awe as we became gradually more excited for our concert. The rehearsal concluded with a run through of America the Beautiful. The echo of our voices and instruments through the hall at the end of the piece sent shivers down our spines. This concluded our rehearsal just on time. We boarded the buses and headed towards our destination for lunch. 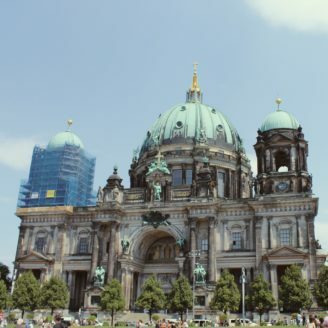 Our buses left us on the bridge to Museum Island, a gorgeous tourist destination in Berlin which houses some of the most extravagant and interesting museums throughout the whole country. Bus one and two split up at this destination. Bus one headed out for lunch and bus two began a walking tour of the Pergamon Museum. I am on bus one along with the rest of the choir and some orchestra members. We headed into town where a beautiful farmer’s market and maker’s fair were taking place. My small group of friends and I made a beeline for the food trucks parked near the farmer’s market and had some of the best street food I could have ever imagined; the street food in this particular truck included various meat sandwiches, burgers, and pulled pork. After a delicious and slightly messy lunch, we made our way towards the maker’s faire boutiques where we bought cute tchotchkes for our family members and friends. We then made our way to the Pergamon Museum. This museum is composed of exhibits of architecture from around the world. We had a wonderful walking tour. During the tour, we learned about the history of the Jordanian sandstone facade gifted to the Prussian people, the Babylonian entryway from the biggest archaeological excavation in history, and a Roman marketfront made of marble. All of which were taken apart in their original locations all to be put back together when they arrived at the museum. After our walking tour, we made our way onto the buses which ever so carefully escorted us back to the hotel. We took an hour of downtime to shower and change into our concert attire. We boarded the buses again and were brought back to the Grunewald Church for our concert. The concert officially began at 7:30 PM with the chorus and ended at 9:30 PM with a spectacular performance of America the Beautiful by the orchestra and chorus joined as one united group. Special shout out to our soloists for the evening – from the chorus: Kathryn Sayler, Molly Perrone, Makenzy Chaikin, and Colin McCready; from the orchestra: Alan Jian. The night was complete with a sit down dinner back at our hotel and a goodnight check-in from our wonderful chaperones. Tomorrow, we travel to Dresden. Can’t wait to fill you in on the spectacular journeys to come!